Bryce Landwehr is a licensed professional counselor with Wellspring Christian Clinic. He graduated with honors from the University of Mobile with a B.A. in Psychology and earned his Master's degree in Counseling from the University of Alabama at Birmingham. He has a passion for those seeking meaning and purpose in the midst of crisis and is dedicated to offering solutions for healthy living. He has experience working with adolescents and adults dealing with anger, anxiety, low self-esteem, depression, suicidal thoughts, self-harm, addiction, and codependency. He also enjoys working with couples struggling to communicate through relationship/marital conflict. 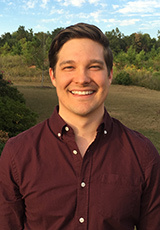 Bryce has gained several years of clinical experience at Brookwood Baptist Medical Center in the Psychiatric Department and partial hospitalization program. He enjoys helping those who struggle with a broad spectrum of mental illness such as Bi-Polar Disorder, Major Depressive Disorder, and Substance Abuse Disorders. Bryce is happily married to his high school sweetheart and is the proud father to their twins. He holds past experience as a youth minister and currently teaches a young adults Sunday school class in his local congregation. He believes the Bible is the guide for an abundant life of freedom and personal growth and approaches every client through the lens of God's Word.